This spring the College of Education is offering an 8-week course aimed at providing students an overview of education in the Spanish region and a comparative experience between European and American education systems. 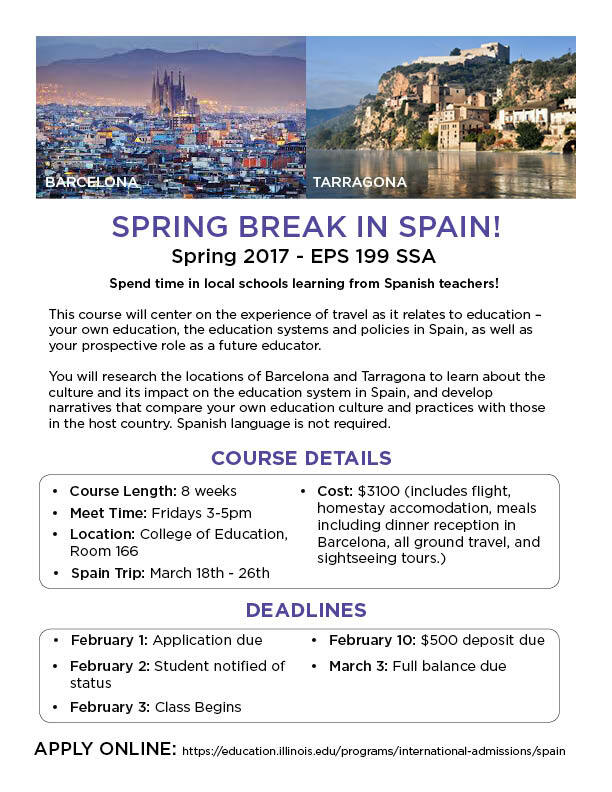 The course involves a spring break trip to Barcelona and Tarragona, Spain. Undergraduate or Gradute students pursuing a related degree are welcome to apply. If interested, see the attached flyer or visit: http://education.illinois.edu/programs/international-admissions/spain. The deadline to apply is March 1. For questions, contact Mackenzie Dankle at dankle@illinois.edu or Dr. Allison Witt at awitt1@illinois.edu. Learn more about the course and trip.